en Does inhibin-B help us to confidently refuse diagnostic testicular biopsy in azoospermia? Background: In the recent years, the use of laboratory blood factors such as FSH and inhibin-B for the assessment of spermatogenesis in different studies has increased; of course, the conflicting results have also been achieved. Objective: To investigate if the measurement of inhibin-B can help surgeon to reduce unnecessary diagnostic testicular biopsies in males with azoospermia. 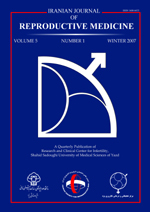 Materials and Methods: This cross-sectional study was done during July 2006 to September 2007 on 41 patients with azoospermia. FSH and inhibin-B were measured and bilateral open testicular biopsy was performed for all patients. Results: Sperm was seen in 29% of biopsies that in 100% of these samples inhibin-B was more than 100 pg/mL and FSH was less than twice the normal (p=0.001). Inhibin-B had significant correlation inversely with testicular fibrosis and Sertoli cell only syndrome (p=0.043 and p=0.011, respectively) and directly with incomplete spermatocytic maturation arrest and obstructive azoospermia (p=0.027 and p=0.013, respectively). FSH was only correlated with obstructive azoospermia (p=0.001). Conclusion: We suggest that if FSH is less than twice the normal, inhibin-B should be measured and if its level is less than 100 pg/mL, we can cancel about the half of unnecessary diagnostic testicular biopsies. Infertility, Histology, Sperm cell, Germ cell, Diagnosis, Azoospermia.